The beaches in this area are clean and popular with walkers (with dogs! ), jet-skiers and windsurfers. 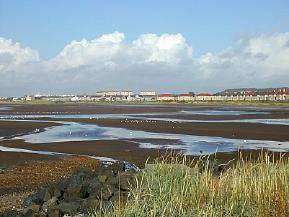 It is possible to walk along the beach to Irvine. There are good views of the Clyde and the Isle of Arran. Good parking at swimming pool and ballast bank. View from car parks or metalled footpaths. National Cycle Route 7 passes near best viewing sites. This area has three main highlights. Firstly, the harbour is a magnet for gulls in winter, Iceland and Glaucous are often resident, with Mediterranean Gull an annual visitor. The Seacat Jetty and inner harbour are particularly good for close views of the northern gulls. The inner harbour is also good for Black Guillemot (up to a dozen at a time) as well as Eider and Red-breasted Merganser . Secondly, the third car park above is good for sea-watching. Offshore can be seen Gannet , Manx Shearwater, Storm and Leach’s Petrel (I’m told! ), and all three commoner Divers . The rocks in front have Purple Sandpiper . Lastly, the North Shore, best seen from the Swimming Pool car park, is a good wader and gull roost. This is where to look for gulls that didn’t appear at the harbour. This area is also worth looking for Sanderling, Bar-tailed Godwit, Twite (flocks of up to 40 around the high-tide line) and Brent Geese . There are decent cafs and restaurants around the Marina and in Troon. This entry was posted in Locations - South Ayrshire on 01-Jan-2003 .